Grande folla in piazza a Kiev per il "conteggio alla rovescia" dell'entrata in vigore del "libero transito" tra UE e Ucraina. Una festa ... come si usa da noi per la notte di san Silvestro, o a Rio de Janiero per la fine del carnevale! Migliaia di persone in piazza ad ascoltare canzoni europee, l'Inno Europeo e la scansione del "Count down" dei minuti che mancavano all'entrata in vigore del trattato "Free Travel" tra Ucraina e Unione Europea. [Ricordo che lo status di "paese associato all'UE" (che è ben diverso da quello di "paese membro dell'UE", tant'è che ce l'ha pure la Svizzera che, a suo tempo, ha respinto con un referendum ad hoc la richiesta fatta – nel 1994 – dal governo federale di Berna di entrare in UE) non era stato concesso all'Ucraina perché richiedeva l'unanimità dei voti in Consiglio dove invece è mancata l'adsesione della sola Olanda. Il governo olandese (presieduto da Mark Rutte sarebbe stato pure favorevole, ma doveva tener conto di un particolare referendum promosso dai nazionalisti-xenofobi di Geert Wilders che, pur non essendo formalmente vincolante, di fatto non permetteva al Governo Rutte di dare il consenso allo status di "paese associato" all'Ucraina perché in tal caso i parlamentari del partito di Wilders (fino allora sostenitori del governo Rutte) avrebbero provocato la crisi di governo con conseguenti elezioni anticipate. Rutte ha resistito fino alla scadenza della legislatura. Nelle successive elezioni il partito di Geert Wilders ha perso molti voti ed ora è all'opposizione. Il nuovo governo di Rutte, sollevatosi dal rischio di crisi, ha quindi potuto "rientrare" con gli altri cambiando la sua precedente "astensione" in "adesione". Ancora una volta, dunque, si può notare come l'UE non sia né carne né pesce! I trattati devono essere dell'UE intera, ma sulle questioni che contano proprio a livello europeo troppo spesso (quasi sempre!) bisogno dell'unanimità; e il fatto che tante volte l'unanimità non si raggiunge non è perché per diversità di visione d'insieme, ma per questiioni di politica locale (quasi sempre di tipo partitico, per non dire "settario", come è stato appunto questo emblematico caso olandese, che non è certo il primo nella ormai lunga storia della CEE/UE). E intanto ... mentre l'UE nell'impasse incapace di decidere, il mondo galoppa a crescente velocità. Quel che manca all'UE è il completo potere legislativo del suo parlamento ed un vero Governo federale – perché tale non è la Commissione Europea! – responsabile davanti al Parlamento Europeo. L'URSS non c'è più da 27 anni. Da decenni ad est c'è Putin che spinge sull'espansionismo della Russia e sull'ingerenza russa nei paesi non solo dell'ex-URSS, specie su quelli della NATO (ormai svilita ... e da decenni deviata dal suo originale scopo). E adesso ad ovest c'è Trump che ribalta le carte del pluridecennale gioco statunitense. L'Europa ha adesso più di prima la possibilità di prendere nelle proprie esclusive mani il suo futuro• Basta che gli europei lo vogliano ... e che siano capaci di scegliersi e promuovere governanti con sufficienti doti da "statisti" invece di eccellenti demagoghi! Torno al titolo del thread (ma questa digressiva introduzione non mi pare superflua!). Sisters Sasha and Karina celebrated Ukraine's visa-free travel on Saturday. 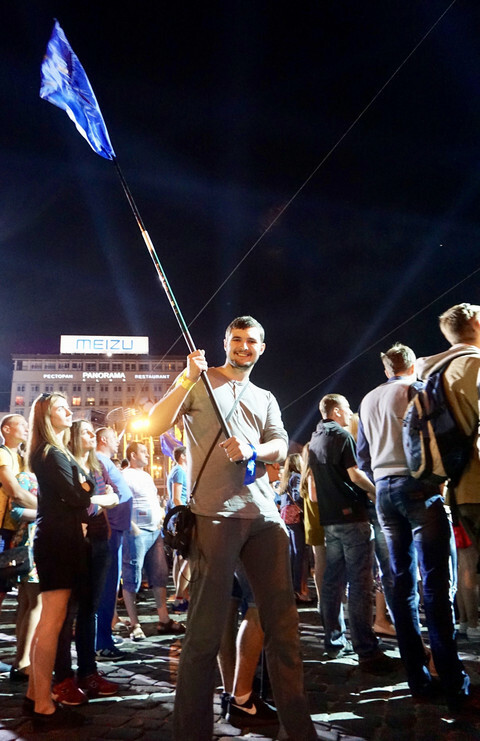 The EU lifted visa requirements for Ukrainian citizens on Sunday (11 June), in a move that sparked joy and expectations of a better future as an aspiring EU country. Thousands of people flocked to Kiev's European square on Saturday for free concerts and an official countdown to midnight. Musical performances included a Ukrainian version of Beethoven's Ode to Joy, which is the EU's anthem. Also on stage was pop singer Ruslana, who performed the Hutsul folklore-inspired "Wild Dances" - the song that won her the 2004 Eurovision song contest. "Go, go to Europe!" Ruslana told the audience. "But then make sure to come back, because no place is more beautiful than Ukraine!". The celebrations featured president Petro Poroshenko, who hailed the success of Ukraine and said visa-free travel marked the country's final and irreversible break with Moscow. "Farewell, unwashed Russia, land of slaves, land of lords," he told the crowds, quoting Russian poet Mikhail Lermontov. "Today, every Ukrainian can drink fantastic coffee in Bratislava, or fly on a low-cost flight to Warsaw, or visit the Vienna opera," Ukraine's head of state said. Galina, a middle-aged kindergarten teacher, said that she would not be going anywhere, however. She could not afford much on her salary. 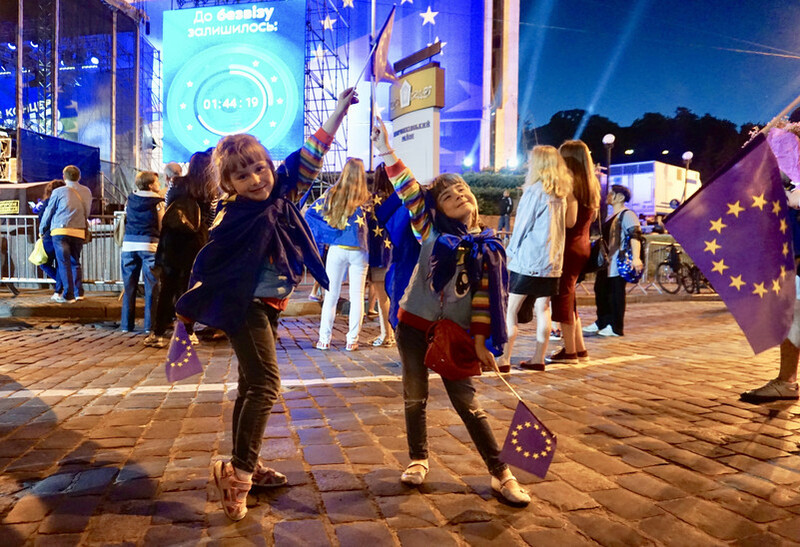 But she had brought her young grand-daughters, Sasha and Karina, to listen to the concerts and "celebrate European values", which she defined as "openness and diversity". As the girls danced and played, Galina told EUobserver that she hoped the fact Ukraine had qualified for a visa waiver would help to enact these values. "Maybe more EU nationals will now come to Ukraine?" the kindergarten teacher said. But other people at the square were certain that they would soon be packing their bags for the EU. Vadim, a 20-year old economics student, already started preparing for this day one year ago, when he applied to secure a biometric passport. Such documents allow Ukrainian citizens to enter the Schengen area without a visa for up to 90 days, for the purpose of tourism or business trips, but Ukrainians are not allowed to take up work in the EU. Recent media reports said some 3 million Ukrainians had biometric passports. Vadim said he would split his summer holidays between volunteering with an organisation that helps Ukraine's war refugees, and a visit to Italy. "I've always dreamt of going to Rome! ", he said. Igor was 40, but a weather-beaten face made him look older. He sat on a security fence waving a huge EU flag and had two smaller ones stuck in the front pockets of his jacket. For many years, he had worked odd jobs in Poland and Germany, and picked up their languages. "By July, I will be in Germany again," he said. When told that visa-free travel did not grant Ukrainian citizens a right to work, Igor said he would find a way - just as he had in the past. Worries of a visa "brake"
The European Commission suggested already in December 2015 that the bloc should waive visas for Ukraine and Georgia. But the deal was delayed after some EU states, including Germany, worried that people would use their new-found rights to work illegally or seek asylum in their countries. Visa liberalisation had been postponed until EU countries worked out a mechanism, a so-called "visa brake" that could be triggered in case of massive overstays or bogus asylum claims, to suspend visa freedom. Ukraine has taken precautionary measures against any such developments. On Sunday, border guards at the Borispol airport presented Ukrainian citizens with information leaflets clarifying their rights and duties, and this information was also given to international train passengers. The EU border agency, Frontex, also sent officers to Ukraine to assist its border guards in case of questions. Ukrainian border officials expect a 30 percent rise in passenger traffic. Ukraine's deputy PM in charge of EU integration, Ivanna Klympush, called on EU nations to "show patience". "Many people could be travelling in the next days because they waited until the introduction of visa-free travel to take their holidays," she suggested. She spoke to journalists as she prepared to wave off "the first visa-free train" on Sunday morning. A 7AM train took passengers from Kiev to Przemysl, a small Polish town close to the Ukrainian border. In the run-up to the visa waiver, Ukraine's national railways have begun providing more direct lines to Poland, and Ukraine has also seen the emergence of low-cost airlines. Klympush said Ukraine had achieved everything it had been asked for by the EU. In exchange for the visa waiver, Ukraine had fulfilled 144 criteria set by the bloc. These included: anti-corruption reforms; tighter border control; a fight against organised crime, and reforms to enhance the respect for the rule of law and human rights. Human rights activist-turned-MP, Svitlana Zalishchuk, said however that the pace of reforms could slow down in the wake of the visa waiver. "Some very important reforms were very difficult to achieve even as they were necessary for visa liberalisation," Zalishchuk told EUobserver in an interview last week. • Three million Ukrainians can soon visit EU visa-free.